"I had to make cookies at the last minute for a school function and a friend gave me this quick and easy recipe. From start to finish, this only takes about 30-45 minutes and the taste is like you spent hours in the kitchen. You might want to make a double batch, because they will be gone before you know it. ENJOY!!" In a medium bowl, mix together the peanut butter, sugar, egg, and baking soda until well blended. Roll dough into 1 inch balls, and place on ungreased cookie sheets. 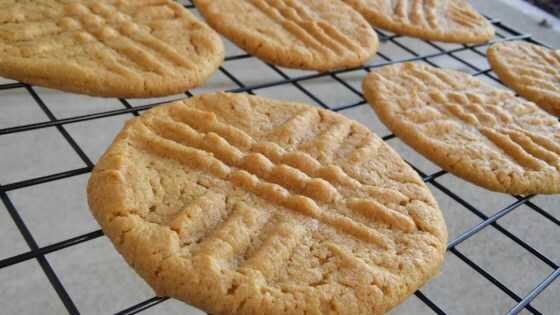 I usually use brown sugar and skip the baking soda when I make these. Be sure to let these cool on the cookie sheet for 5 minutes before removing to a wire rack, or they may fall apart.